It's official. We are obsessed with Pinterest. I love how it helps you discover and organize all the things you love. 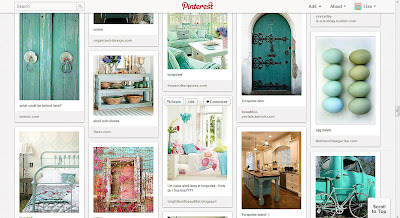 From all things turquoise, recipes, to DIY projects Pinterest is quickly becoming my favorite tool to organize all the great things I find on the internet. We open the account last nite and we already created 2 boards to die for. My favorite is "For the love of turquoise" so make sure you check them out. I'm getting so many ideas for my home that is mind blowing. If you want us to follow you on Pinterest please leave us you link in the comment section and we will follow you back. Have a Pinteresting day. Let's start pinning! !